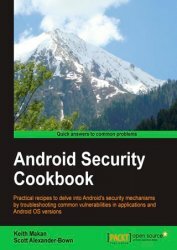 Android Security Cookbook discusses many common vulnerabilities and security related shortcomings in Android applications and operating systems. The book breaks down and enumerates the processes used to exploit and remediate these vulnerabilities in the form of detailed recipes and walkthroughs. The book also teaches readers to use an Android Security Assessment Framework called Drozer and how to develop plugins to customize the framework. Other topics covered include how to reverse-engineer Android applications to find common vulnerabilities, and how to find common memory corruption vulnerabilities on ARM devices. In terms of application protection this book will show various hardening techniques to protect application components, the data stored, secure networking. In summary, Android Security Cookbook provides a practical analysis into many areas of Android application and operating system security and gives the reader the required skills to analyze the security of their Android devices.